National brands will outpace regional and local SMBs in total ad spend to target local audiences. National brands will comprise 43% of total 2018 local media spending. National brands will increase their local ad spend by 19% in just 3 years, reaching $74 Billion in 2021. Local assets matter more than brand assets– increasingly important for multi-location brands to develop customized advertising and marketing assets for each location. Print will continue to evolve and maintain a large share of small businesses’ dollars by extending campaigns with digital media. One-third of mobile searches are local and growing 50% faster than overall mobile searches. Local advertising revenue in the U.S. will reach $151.2 B in 2018, up from $143.8 B in 2017. Traditional media will comprise 7 %of the revenue, with online/digital securing 35.3 percent. Among those who live in smaller markets, 71% of people use local print media to help influence their buying decisions. Social media ad revenue from mobile (not including tablets) now represents just over 70% of social ad spending–and will grow to 80% by 2022. It’s crucial that local businesses are present in every potential platform that prospects are likely to be looking for them. 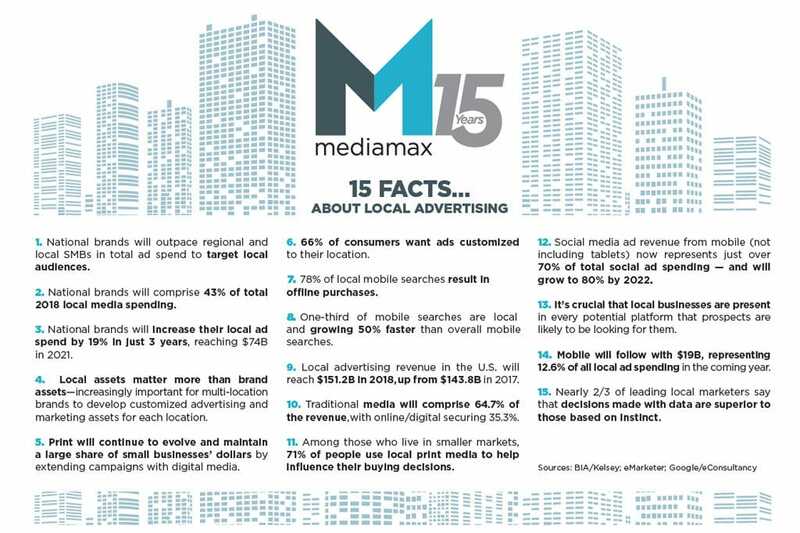 Mobile will follow with $19.0 billion, representing 12.6% of all local ad spending in the coming year. Nearly 2/3 of leading local marketers say that decisions made with data are superior to those based on instinct.